Smart Communications has released it second Netphone offering. The second Netphone is a Samsung Galaxy Y. 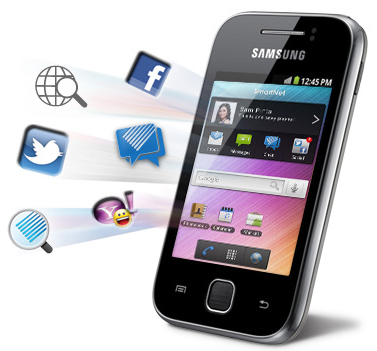 The Samsung Galaxy Y is a basic Android handset, this one coming with Android 2.3.4 (Gingerbread). It has a a 3-inch screen with a 240 x 320 resolution, a 832MHz processor, 160MB of internal storage and a 2MP camera. Nothing in its specifications is particularly impressive, but for the asking price of Php5,990 it specifications are decent enough, but it is a bit hard to recommend. The biggest disappointment, and main reason recommending this phone is difficult, is the 240 x 320 screen. In order to get a good Android experience, at least a 320 x 480 screen is needed. Globe Telecom's Cloudfone Ice is Php1K cheaper and does have a larger (3.2-inch) higher resolution (320 x 480) screen. Still this could be a viable option if calls, messaging and social networking is your primary use for it. Web browsing and gaming will be a marginal experience. It is a Netphone, meaning it does have access to its Smart Communications proprietary messenger and social networking apps, with a global directory which stores your phonebook online under the SmartNet brand. The phone is also available for free on Smart's All-in Plan 800 and a new Data Lite Plan 500.